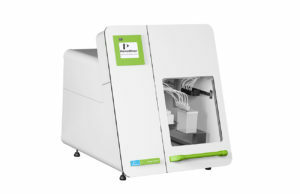 The chemagic Prepito instrument is based on PerkinElmers proven technology for magnetic particle separation and represents the top quality sample preparation system available as small size instrumentation. It utilizes many years experience in automated nucleic acid isolation gained with the high throughput instrument chemagic MSM I. In combination with the well known Prepito Kits it delivers high yield and purity DNA/RNA and ensures the success of your research downstream application. The chemagic Prepito achieves magnetic separation by metal rods that are magnetised by an external magnet and that are immersed into the several process solutions (right scheme, top). To enable the often complicated resuspension step of once separated magnetic particle pellets e.g. in wash or elution buffers, the magnet can be switched off. Resuspension is then realized by rotation of the rods guaranteeing the efficient, complete and smooth resuspension of the bead pellet (right scheme, bottom). This normally difficult step becomes now quick and thorough, resulting in isolation products with both high yields and purities. 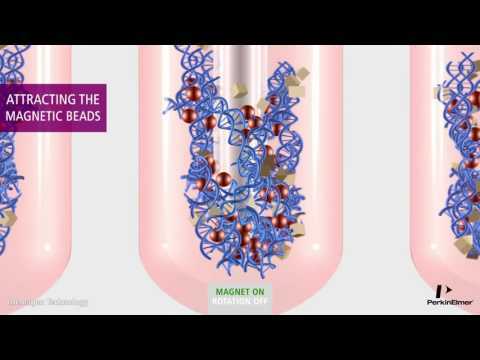 The separation of nucleic acids is achieved through their capturing by highly specific binding M-PVA Magnetic Beads that are thereafter attracted to metal rods, magnetized by an electromagnet. While these magnetized rods transfer the DNA bound to the particles through the different process solutions, the rod rotation, switched on after deactivation of the electromagnet, leads to efficient and homogeneous resuspension of the particles during the preparation steps. This results in high yield purity DNA/RNA for downstream applications. This innovative instrument realizes cost effectiveness through automated dispensing of buffers into standard plastic devices instead of using expensive pre-filled cartridges. It includes barcode reading to provide comfort and to support highest quality assurance demands. Hands on time is minimized. Processing time is as short as 30 min. for 1 or up to 12 samples per batch.